A mid-week special this time, with Star Trek, Star Wars, Malthus, Snails, Berets, plus tips on how to cope in the modern world. 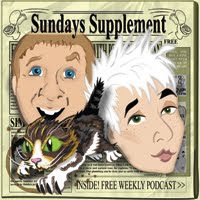 This week, religionistas, the only good type of psychic, easter eggs, diet secrets and Dear iszi. This week, Mad Men, Red Dwarf, Death, Formula One, Fashion Tips, Insulting Tweets, South Park, Fern Britten and more Humdongers. Apologies for the continued delays with iTunes and it's stoic inability to play nicely with our feed. This week GMT, Su Doku, Cold War spies, The Wire, Dot Cotton, Puddings, Leonardo, The Farmer In The Dell, puzzles and a brand new section.